If I am going to eat dessert, it better be good. It better be worth falling off the wagon for. Usually Passover desserts do nothing to tempt me from my sugar abstinence and that’s not necessarily a bad thing. But I cannot in good conscience be the bringer of a sticky, heavy honey nut cake or one of those Maneschewitz Passover cakes from a mix. I want to share a dessert that I would be happy to eat any time of the year, not just on this 8-day hiatus from flour and other ingredients crucial to baking. Enter coconut macaroons! 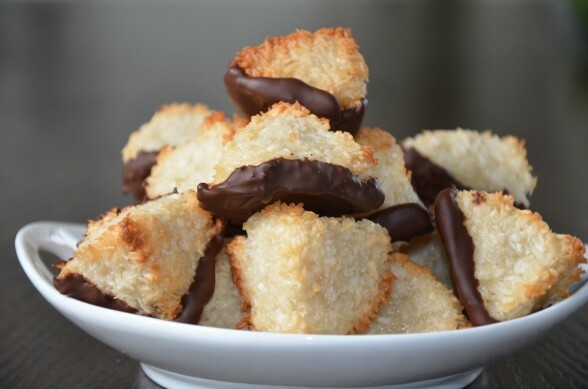 I have tried more coconut macaroon recipes than I care to admit (about 5 pounds worth on the hips and thighs), but this is truly the best. This recipe is adapted slightly from pastry chef and cookbook author, David Lebovitz. It is exactly what I want in a macaroon — toasted on the outside, dense and chewy on the inside, but not so sweet that it will make your teeth ache (probably because I cut the sugar a bit.) I use almond meal instead of flour so that they are Passover-ready and gluten-free, because these days everyone knows someone who is not eating gluten. I have a news flash — don’t be put off by the use of almond meal. 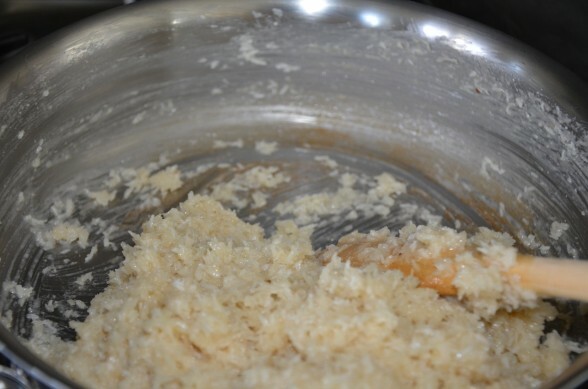 It’s nothing more than blanched almonds ground up (in the food processor, if you wish) to a fine meal. My natural foods supermarket even sells almond meal in the bulk bins. I happen to love coconut and I am a believer in all the health benefits that coconut has to offer. It is rich in good fats, especially lauric acid which is an immune-boosting fat otherwise only found in breast milk. The key is to start with unsweetened, shredded coconut which you can find in the bulk bins at the natural foods supermarket or in bags. I try my hardest to use unrefined sweeteners whenever possible, but only if it makes for the best result. In this case, granulated sugar is best here, so let’s make these cookies small, ok? If you would like to bake these for Passover, or for your child’s mock Seder in religious school this week, then you can start cooking lickety-split. You all know how I love a do-ahead! You can make the macaroon batter a week ahead and keep it covered in the refrigerator or even freeze it. The cookies can be baked a few days in advance and kept in an airtight container far away from recovering sugar addicts, especially if they’re dipped in dark chocolate. Stay tuned for another fabulous Passover-appropriate or all-around yummy dessert later this week! 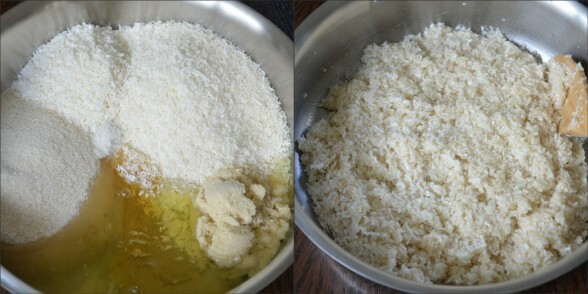 In a large skillet combine coconut, sugar, honey, almond meal, salt, and egg whites. Please do as I say and COMBINE everything BEFORE placing over heat, otherwise you will end up with a coconut frittata. I'll give you one guess how I know this. Place over medium-low heat on the stove, stirring constantly. When the mixture just begins to stick to the bottom of the pan, almost about to scorch, remove from the heat and stir in the vanilla. You are going for sticky, not dry and pasty. Transfer to a bowl to cool to room temperature. You can refrigerate the dough for up to one week or freeze up to one month. Preheat the oven to 350 degrees. Line 2 baking sheets with parchment paper or a silicone baking mat. Using a small ice cream scoop, form the dough into little mounds and space them evenly on the prepared sheet pans. Shape them into little pyramids, if desired. Bake for 18-20 minutes or until golden brown. Transfer to a cooling rack to cool completely. If desired, melt chocolate in a heat -proof bowl set over a saucepan of simmering water, aka a double boiler. Dip cooled macaroons in chocolate (wherever you like -- tops, bottoms, sides) and allow to cool completely on cooling rack or on a parchment-lined baking sheet if you dipped the bottoms. If history repeats and you need to make like an Isrealite, stick the chocolate covered macaroons in the fridge to harden the chocolate quickety-quick. 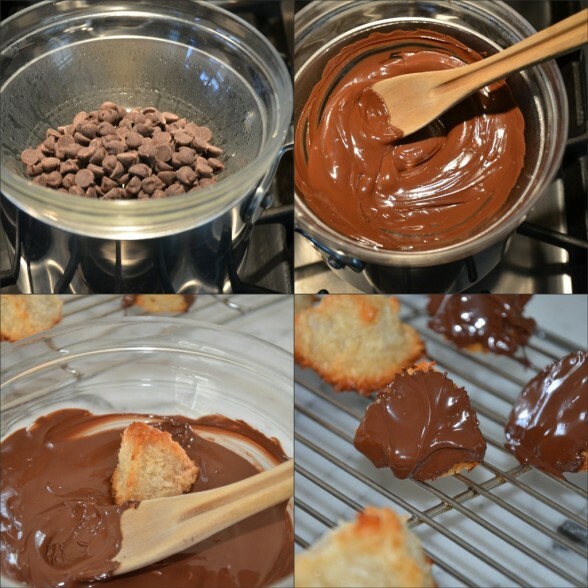 You can also add some mini-chocolate chips to the cooled macaroon batter, then shape and bake. 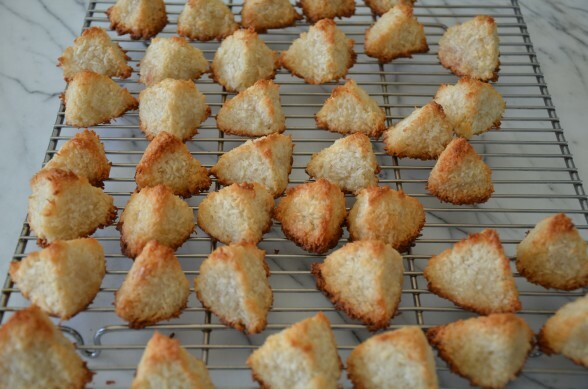 I have been using your macaroon recipe for Passover for YEARS now! I discovered it randomly and now I swear by it! These are the macaroons I dream of – crisp on the outside, and gooey on the inside. I did have an issue last year when I did the dough ahead of time – I should have let it come to room temp before scooping; it was quite difficult and they were a little dry. I can’t wait to make them again this year! Thanks for the feedback, Erin! I think the key if you make the batter ahead is to make sure you have it in a container that doesn’t have too much air at the top. And yes, best to let it come to room temp before scooping. Enjoy! Can you make a week ahead and freeze? Trying to make as much ahead of time as possible. I personally haven’t frozen macaroons, but I know lots of people who have with success. Bake them, cool them and then wrap them well. I’m sure they won’t take too long to defrost, although I would take them out no later than the morning of to be safe. Hi! Love your macaroons! I made them last year and they were such a hit. You think I can make them today (Wednesday) and serve Friday for Passover if put in air tight container? Essentially 48 hours before. Thanks! Chocolate Coconut Macaroons may look like a cookie, but they have the taste and texture of a candy bar. Moist and chewy, their chocolate flavor is rich and satisfying and goes so well with the sweetened dried coconut. These are excellent warm from the oven or at room temperature. But my favorite way to eat them is straight from the refrigerator, when they are nice and cold. I love them cold, too! These macaroons are similar to the ones I make. I adore the triangular shape. Happy Passover from our home to yours. P.S. I enjoy your IG posts! I wonder if our families are related! the greatest weight-loss foods around. Hi Pamela, might be a silly question, but do I melt the raw honey or leave it solid? Not silly at all! Since you’ll be cooking the honey with all the other ingredients, it should melt in the pan. I should change the the recipe though. it’s not necessary to use raw honey since this isn’t a raw dessert. Just a habit of mine since I only have raw honey in my kitchen. I am interested in making these without the refined sugar. Do you have any suggestions for a substitute? Cathy, I am not sure what you could use in place of white sugar except perhaps stevia. All honey or maple syrup would be too strongly flavored and the darker, less refined sugars would make the macaroons too brown and perhaps have a hint of molasses. If you try stevia, start with 1/4 teaspoon and taste the batter before you bake. That’s my best suggestion! Wow! I know I’ve had coconut macaroons before, but had no memory of it. I saw this recipe and had to try it with my new unsweetened coconut and almond flour. Wow! I could hardly keep from eating the dough out of the pan (after it had cooked)! These are amazing and taste so yummy. I’m sure they’re good dipped in chocolate, but I like them just as they are. Thanks for this recipe! Thanks for your awesome feedback, Sarah! I just made three batches of these yesterday and I have to agree with you — so yummy! Delicious!!!! I scoured the internet for a macaroon recipe that did not include wheat flour (I was surprised at how many there were with flour) or sweetened condensed milk…I found plenty but yours won out. Man, they are perfect and the pyramid-like shape makes them a little more special. The only thing I did differently was to add coconut oil to the chocolate chips to make it a smoother consistently and to help keep the chocolate hard at room temp. Thanks! That’s exactly what I wanted too — no flour and NO sweetened condensed milk (blech!). Good call on the coconut oil in the chocolate! Thanks so much for your feedback! Can I use regular honey instead of raw honey? Since my daughter is making the Seder this year, I have time to make the desserts. Just finished my first batch!! absolutely delicious and not too sweet – just like you said. How nice for you! Just finished baking my last batch myself. Have a lovely holiday! These are delicious and easy to make. My daughter has made many times and they are a hit with everyone. I did my first Seder this year and used your macaroon recipe. Super easy recipe and super delicious, they were definitely a hit. Never again will I buy Manischewitz macaroons! Thank you for helping make my first Seder a memorable one! Thanks, Stacey. I am thrilled that you had a great Seder. I agree — those macaroons rock! I feel like the “Coconut Macaroon Bunny”! After making your fabulous cookies for two different groups of pre-Easter dinner guests and receiving rave reviews, I decided to bake more of them to deliver to family and friends for the holiday. The recipe is very easy; however, I drizzled the melted chocolate over the macaroons to focus more on the yummy coconut flavor. Thanks once again for another winner! Heehee! Good one. I bet the drizzle of chocolate was just lovely, too. Thanks for the delicious recipe! 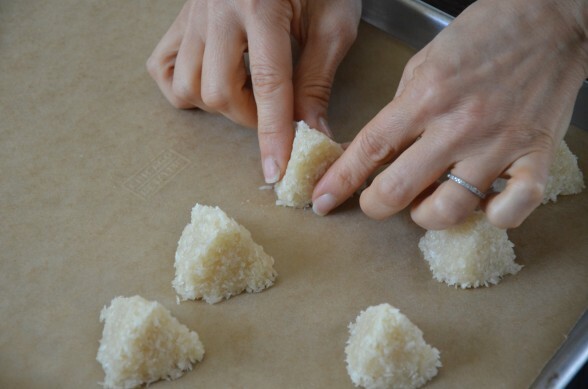 Although the shape of the macaroons you made is not technically a pyramid (3-sided on top instead of 4-sided), perhaps in deference to the story of Passover it might be better to make a different shape of macaroon! Afterall, the holiday is a remembrance of escaping slavery in Egypt! You make an excellent point! I think I was trying to make the “Hershey kiss” shape I have seen so often in bakeries and I just called it a pyramid. Can you guess I never went to Hebrew school? Thanks for the comment! I made these yesterday in preparation to take to my mom’s house tonight. In one skillet I used egg whites cracked from eggs and in the other skillet I used the egg whites from a carton. I thought I’d just follow the measuring instructions on the back of the carton to determine how many egg whites I was using. WRONG! The mixture from the egg carton skillet was way too watery. So I improvised and just added more of all the ingredients in order to make the consistency the same as the other skillet. I ended up having to double the recipe! It was a good thing I had more of all the ingredients. They turned out great. By the way, the recipe says it yields 30. I only got 20. Perhaps my baller was larger. But hey, they look amazing. So it’s the perfect item to bring to a seder because it’s delicious and impressive looking! Thanks for the helpful feedback, Linleigh. I’m sure there are other readers who will want to use liquid egg whites. As for the ice cream scooper, mine is about 1 1/4 inches in diameter. Have a lovely Passover! After a big Seder shop, Gelsons nor Ralphs, had unsweetened coconut flakes. I did not want to go into yet another market!! Have no fear…after going back and forth with Pamela, she held my electronic hand, and told me it would be all right. So I cut the sugar in half and used the sweetened flakes and ya know what?….it turned out just fine! Thanks Pamela! Thanks Laurey! I’m sure you’re not the first person to look for unsweetened coconut unsuccessfully. Good to know how to adjust the recipe! I just did a test-run of these since I am bringing macaroons to a seder on Monday. OMG! Best. Macaroons. Ever. I’m so excited to share them! I have the good fortune of being Pamela’s “mamacita,” and I loved these delicious macaroons! I am hoping she will ask me if she could bring something for Passover, because this will be it. now have the recipe! Gracias Pamela. Not to worry. I will come bearing macaroons! Scrumpshillyitious!! Made them already and making them for two seders next week!! Thanks! Thank you, Nancy. Have a lovely holiday! Haha!! I’m right there with you except the only thing I like more than coconut is coconut with chocolate! I try to test recipes with you vegans in mind, but sometimes I don’t have enough time to get it right. I did try the macaroons with coconut milk instead of egg whites and they didn’t hold together well enough. If I had more time, I would have tried coconut cream. I think the EnerG should work, but I haven’t tested it. If you try it, you want the batter to be moist. Let me know if you give it a go! I love coconut more than fat kids love cake. I want to make this recipe – but “vegan-ize” it. Do you think I could use EnerG egg subsitute for the egg whites? I will use the maple instead of the honey since honey is not vegan. No chocolate as I love my coconut plain…although maybe some dark chocolate might be yummy too. 🙂 These look delicious. I love your blogs! Hey Pamela! I’m allergic to almonds…any other flour/meal you would recommend? I think you could probably use all-purpose flour, although I haven’t tried it.